Hello everyone! I hope you have a marvellous Christmas and all warmest wishes for 2011. This is the American Christmas Moth which I'm pretty sure is a relative of our Winter Moth featured in the post below. It doesn't normally wear a Santa hat; I've added that after hours of laborious experimenting with Adobe Illustrator, Photoshop etc. No mothing for me tonight, though. Quite apart from the possibility of disturbing Father Christmas on his rounds, it's minus 4C and the bulb might blow. 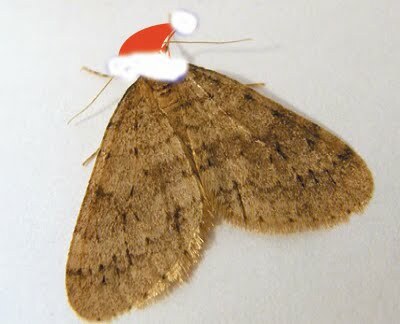 And surely no sensible moth can be out and about. All the very best 'til next time, M.
The weather is doing a Sword of Damocles act over the North of England at the moment, although the fact that the Daily Express today forecasts the worst blizzards for a century reassures me that it will be mild and warm after all. (My older son has experience of doing weather stories for the irrepressible DE, and what can happen to them after they leave the reporter's tender care. These moths aren't too worried, anyway. In spite of the doom-mongering (and even my own employers have bee trying to convince me that this may be the worst winter since 1963), I counted seven moths in the car headlights along our road on Tuesday night and another two yesterday evening. A tenth fluttered down from our porchlight, so I thought: blizzards or not, I'll set the trap. Lo! Here are two Winter Moths as a result. 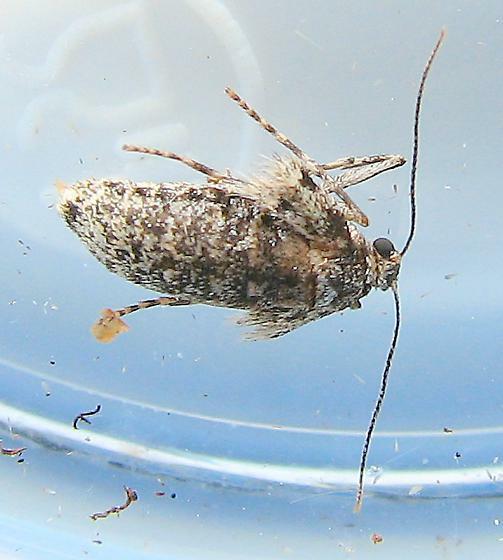 Conceivably, the more patterned of the pair might be a November Moth, but I don't think so. Experts, if you are still reading in these largely mothless months, please put me right if necessary. 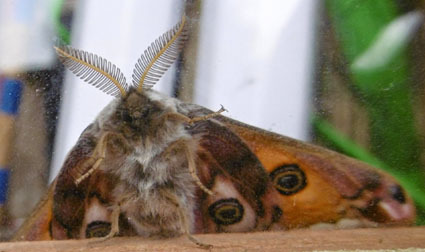 The description of the Winter Moth in my Bible is as accurate as always; it mentions the fluttering in car headlights, the habit of coming to ordinary lights and the susceptibility to light traps. 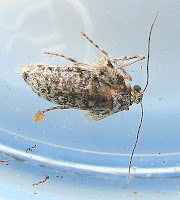 It also gives space to the unfortunate female of the species, which is virtually wingless (see pic below right, courtesy of bugguide.com) and cannot fly. For those who like sexual excitement, this has the one compensation that males have been known to carry females in flight while copulating. I don't know, and I wonder whether scientists do, whether this involves consent. ...with apologies for the blurring, here is a sequence of one of our jays eating the kindly Wainwright peanuts on the lawn. I couldn't get closer because these striking but raucous birds are as jumpy as Mexican beans. Penny and I were walking back last night from our car, which we're leaving at the end of our steep and windy road during the snow, when we heard plaintive wails from the fields below our house. It was twilight, and we could just make out shadowy shapes wheeling around the dozy clusters of sheep. It was from these shapes that the wails came. 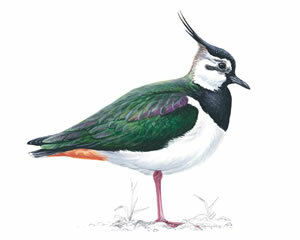 They were peewits, or lapwings. For the second year running, extreme cold has brought them down from the moors to our river valley in Leeds. It isn't exactly warm here, but certainly much less chilly than the birds' usual haunts such as Blubberhouses or Almscliff Crag. I managed to get this rather distant photograph of one of them this morning (above). You can, I hope just make out its distinctive crested head in the close up (right), with the sheep for scale. Lapwings are full of interest. The name comes from their feint, pretending to be injured and dragging a wing as they lure potential predators away from their open, vulnerable nests. Their eggs were once considered a delicacy. More mundanely, they were used in their thousands by the Government in the Second World War to turn into powdered egg and bolster the ration. Once very common, they are now on the Red List of potentially threatened species, although in Yorkshire there still seem to be plenty about. What happens to bees in winter? In the case of this one, nothing more. The rest is silence. I spotted it on our road, a sad little speck in the snow. You seldom encounter dead insects in the wild, but this one showed up in the overwhelming white of our local world just now. Maybe a car got it. Maybe it succumbed to the intense cold. Thermometers recorded minus 19C in North Yorkshire this week, which for us is pretty severe. "The workers bees and drones, who toiled for the queen all summer, are rewarded for their efforts by a certain death in winter. No bother...they are easily replaced by cheap labor, when the queen lays more eggs in the spring, and puts her new brood to work." Little fascists. I'd rather be a ladybird such as this one, creeping around on my 'Mousey' Thompson napkin ring, the only thing I could afford at the great woodcarver's store below the White Horse near Thirsk. Ladybirds hibernate en masse in our house and now that we've pumped up the central heating, some of them think that it's Spring. There were ten ploughed fields, like ten full-stops,"